Rebekah Davis first visited G.O.D. Int’l in 2010 after graduating with a B.A. in Biblical Studies from Multnomah University. She decided to continue her study at the Institute for G.O.D. Int’l, where she has been a full-time student for the last four years, as well as Teacher’s Assistant and Bible teacher for elementary-aged students. This summer, Rebekah is directing a Camp Skillz for youth in the Hopewell neighborhood, implementing biblical practices and values to nurture children’s development. I never aspired to be a Camp Director. What I really wanted to do was teach middle school aged students the bible and talk them through what considerations they would need to make if they wanted to have a meaningful future. But as I explored youth programs in Nashville, I kept recalling the kids in my own neighborhood, all of whom lack the access to pricey summer camps like the ones I was looking into. I remembered Jesus’ teaching to love your neighbor, specifically those whom you see are in need around you. The grand majority of Hopewell (my neighborhood, and where the G.O.D. Int’l headquarters is located) is low income, and unless people volunteer their time to help, they are left to create their own “fun” in the summer months. Hopewell has historically been the neighborhood on the ‘wrong side of the tracks,’ originally the home of Andrew Jackson’s slaves, Jim Crow laws, and segregation. While there are currently multiple ethnicities present in the neighborhood, one thing remains the same–a majority of my neighbors live below the poverty line. G.O.D. Int’l moved it’s headquarters into this neighborhood in 2009 with the hope to make a difference. Camp Skillz is one program that allows us to do just that. For the last three summers, G.O.D. Int’l has sponsored a two-week camp program for the neighborhood children in Hopewell. But this year we are offering a solid eight-week camp, serving upwards of thirty children aged 6-14 from the Hopewell neighborhood. The camp is offered at an extremely low cost, and runs Monday through Thursday from 8:30-1:30. In the Tennessee heat, water activities are a must in July. But at Camp Skillz, activities like these are also an opportunity to learn lessons about teamwork, competition, and rewards. Listening to Jesus’ words to prioritize the needs of those closest to me, I began expanding the Camp Skillz program to include more children for a larger portion of the summer. Now, just months later, I find myself donning a safari hat, leading silly songs at the top of my lungs, teaching a cooking class, filling water bottles and cheering ecstatically for my team of 7 year olds as they run relay races while being sprayed with water! We have a lot of fun at camp. But more than that, we empower young people with confidence as they learn both practical life skills and invaluable lessons of possessing strong character. During the first two weeks of Camp Skillz, a dozen boys aged 6-14 gathered each day in the Building Workshop and constructed full-sized picnic tables from start to finish. The campers were visibly proud of their newfound ability to use tape measures, speed squares, sanding blocks, and for the older boys, an electric drill and power sander. These picnic tables are now the lunch tables at which the children eat–and there’s room for more, as we anticipate more campers to join us this summer. The tables are a daily reminder to the campers that they didn’t only acquire a useful skill in their camp project, but they helped contribute to neighborhood events for years to come. In cooking class, campers learned the basics of following a recipe and keeping a clean, safe work area. Children practiced their fractions as they utilized units of measurement and discussed the scientific properties of yeast in a lesson on homemade pizza dough. Elijah Galford, Eved Roufs, and Elijah Smith enjoy lunch at the picnic tables that the boys helped build. Eved dons a “superhero” mask that reads “servanthood”–the most heroic of all traits, and also, the meaning of his name (Eved means “servant” in Hebrew). Eved received the mask after displaying servanthood to other campers and counselors throughout the week. The theme for the second session of Camp Skillz was “Superheroes.” Campers were taught that even though they don’t have magical powers, they can practice compassion and creativity and be heroic through acts of service. This week younger campers got the chance to be ‘superheroes’ to elderly women in the neighborhood as we visited them bearing bundles of collard greens cut fresh from the community garden. The smiles on the women’s faces were less a result of the produce and more because of the joy the 6 and 7 year olds brought as they sang songs and gathered around the ladies for hugs. These kinds of deliveries are a regular part of the Camp Skillz schedule, making tangible the lessons we discuss about serving others with compassion. For our older campers, the “Superheroes” theme was tailored to be specifically relevant to them. They participated in team building challenges that focused on the effect one’s speech can have–either to shut people down or to encourage participation and trust. 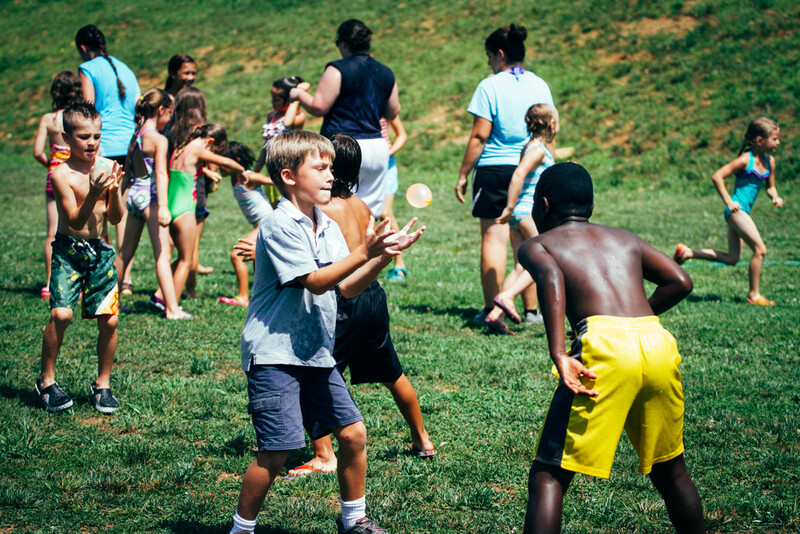 It is wonderful to witness the daily excitement of campers combined with the opportunity given to them by hard-working adults who want to follow Jesus’ example to focus their efforts on children. As counselors, we hope to give these children new ideas about what they could create with their hands, say with their words, and accomplish with a strong character that allows them to develop the healthiest of friendships.